The author has spent 7-years doing research on diabetes. Food is the most difficult factor in controlling postprandial glucose (PPG). His approach is to identify the quantitative relationship between PPG and meals, such as location, type, and contents. He developed a SmartPhoto software to collect his meal data and stored them into a relational database with artificial intelligence (AI) capabilities. The established important data include nation, meal location, food type, dish name, and nutritional ingredients. This system can estimate his consumed carbs/sugar amount and then predict his PPG value combined with exercise, medication, weather, stress, sleep disturbance, illness, measurement delay, etc. He selected a period of 944-days (6/1/2015-12/31/2017) with 2,829 meals and ~87,000 data for his analysis. He made 67 trips to eight nations during this period. 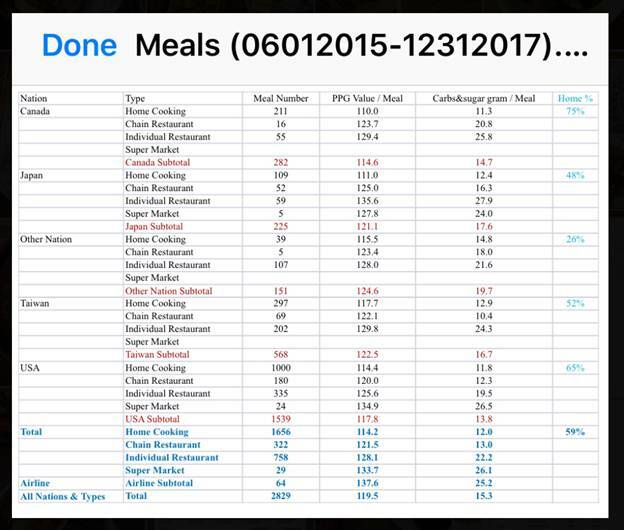 The summary results are listed by both nation and meal location and then sorted by PPG value with the format of (average PPG mg/dL, carbs/sugar gram). The correlation between PPG and carbs/sugar gram is disrupted by exercise and other secondary factors. In total, he had 59% of meals at home and 41% outside. This analysis assisted him to successfully lower his PPG from 279mg/dL to 119mg/dL. His PPG prediction accuracy reached to 99.9% including weather influence.